Holly Tree Barn at Ashlin Farm Barns in Dunholme, near Lincoln sleeps 10 people. 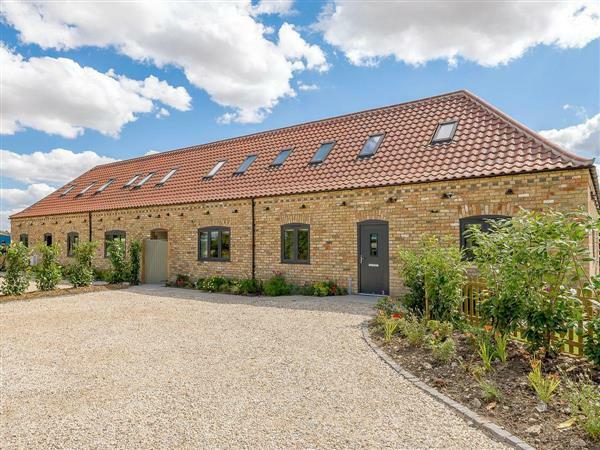 Ashlin Farm Barns near Lincoln is just 5 miles from the centre of Lincoln; these four luxury holiday barns are nestled on a quiet, no-through country lane with the owners living nearby. Each barn is arranged around its own private inner courtyard, and they also have a swim spa, with the facility to comfortably seat 10 people, which can be used as a hot tub to relax in after a day exploring the area. For those who enjoy wildlife, there is a 50-acre nature reserve further down the lane, close to the barns, where there are excellent walks and opportunities for bird watching. On site, there is a large well-stocked coarse fishing lake which has seating, making this an ideal place to relax and enjoy the tranquillity of the surroundings and while away the days whilst fishing. Visit the imposing castle in Lincoln, with the Magna Carta visitor centre and the beautiful cathedral in the city, and stroll down bustling Bailgate, one of the most historic parts of Lincoln’s Cathedral Quarter, with its cobbled streets lined with independent boutiques, shops many restaurants and bars. The university city of Lincoln offers a good evening out for everyone, sampling the many excellent restaurants and bars making this a popular choice for a holiday location. Lincolnshire Showground, which hosts an array of events throughout the year, the Scampton Airshow and heritage centre is just 8 minutes’ drive away. The Lincolnshire coastline, with its sandy beaches and traditional seaside resorts, is 45 minutes’ drive away, whilst the Lincolnshire Wolds, an Area of Outstanding Natural Beauty, with pretty market towns and country pubs, are close by. Whether looking for somewhere to celebrate an occasion with family and friends, wanting somewhere to simply relax in, or just needing a base from which to explore the area, these barns make ideal, luxury accommodation. The shop, pub and restaurant are 1 mile from Ashlin Farm Barns near Lincoln. Holly Tree Barn (ref UKC1353), Red Oak Barn (ref UKC1354 [Red Oak Barn]), Field Maple Barn (ref UKC1355 [Field Maple Barn]) and Wild Cherry Barn (ref UKC1356 [Wild Cherry Barn]) can be booked together to sleep up to 40 people. Living area: With wood burner, 52’’ Smart TV, DVD player and iPod dock. Kitchen area: With electric oven, electric hob, fridge/freezer, dishwasher and washing machine. Bedroom 1: With king-size bed, Smart TV and en-suite wet room with shower and toilet. Bedroom 2: With king-size bed, Smart TV and en-suite wet room with shower and toilet. Bedroom 3: With king-size bed, Smart TV and en-suite with shower cubicle and toilet. Bedroom 4: With king-size bed, Smart TV and en-suite with shower over bath, and toilet. Bedroom 5: With twin beds, Smart TV and en-suite with shower cubicle and toilet. All properties: Oil underfloor central heating, electricity, bed linen, towels, Wi-Fi and logs for wood burner included. Travel cot and highchair available on request. Welcome pack. Large garden with garden furniture and barbecue. Hot tub for 10 (private). Sheltered courtyard with garden furniture. Coarse fishing on-site (free of charge, licence required). Private parking for 7 cars. No smoking. Please note: There is an unfenced lake, 550 yards away, and two unfenced ponds in the grounds. Holidays at Holly Tree Barn, Ashlin Farm Barns run from Friday to Friday. Pets allowed at Ashlin Farm Barns - Holly Tree Barn. For a better idea of where Ashlin Farm Barns - Holly Tree Barn is, you can see Ashlin Farm Barns - Holly Tree Barn on the map below. You can find more large holiday cottages (that's cottages which sleep 8 or more people) in Lincolnshire. If you want to see more large cottages, have a look at large cottages in Lincolnshire. Ashlin Farm Barns - Holly Tree Barn is in Lincolnshire; should you be on the lookout for a special offer, you can find all the special offers in Lincolnshire. It's always worth checking to see what is on offer at the moment. Do you want to holiday near Ashlin Farm Barns - Holly Tree Barn (UKC1353), you can see other cottages within 25 miles of Ashlin Farm Barns - Holly Tree Barn; have a look to find your perfect holiday location.